Teaching children about any career path is always beneficial, but architects and engineers have a definite advantage over other careers in engaging children’s imaginations. There are countless activities individuals or firms can organize that will teach kids about their field and inspire them to be more imaginative in their own lives. Here are just a few ideas taken from my past experiences to spark your imagination. 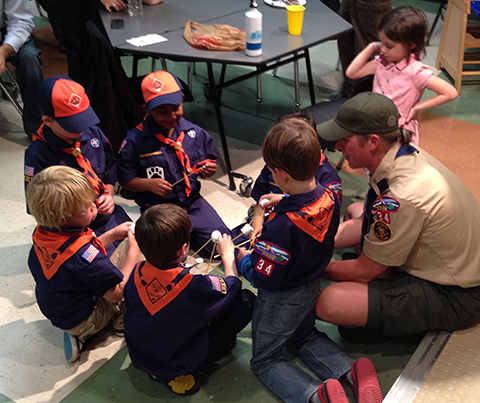 Host a troop of boy scouts or girl scouts! This is an especially great events for firms comprised of multiple disciplines. Each department would organize a simple activity that gives the kids a taste of what they do every day. For example, architects can have kids layout their dream tree house, and structural engineers can have them build a structure out of every day supplies (a card house, a toothpick and gumdrop bridge,…). Organized the day to lead kids through the design process, teaching them about each step that a house must go through before being built. Make sure to communicate with scout leaders to ensure that requirements for engineering patches are met. Organize a balsa wood bridge competition. These competitions are best for middle school and high schoolers, who can better grasp the design concepts behind designing a stable structure. I’ve seen two ways of doing this event. 1) Sending out information and rule packets with a set amount of balsa wood a month or two before the competition day and having kids bring their completed bridges to be load tested on competition day. 2) Give a presentation about basic design concepts, have kids build their bridges, and then test them all in one day. Other options are tutoring (find a company to go through to make finding kids and managing funds and times easier), becoming a big brother or big sister (or a any type of mentor), or judging science fairs at local schools. Be creative! There are many different opportunities to engage kids in your career field. Spending one day with a child may inspire them to become a designer! And you may learn a little something in return.